It pays to get the best advice when buying or selling tickets for an event. Whether you are attending or hosting an event, here are some commonly asked questions answered by an event manager from Pretty Clever Events. What's The Best Way To Buy Or Sell Tickets? These days the majority of ticket sales are offered online through ticket agency websites, or direct through the venues or event sites themselves. It’s still possible, of course, to buy tickets by telephone or by postal application, but more and more people are booking online. Advantages include being able to see seating layouts and, in some venues, selecting your seats visibly through the website. As long as you are purchasing through a reputable site, it’s safe and pretty hassle-free. Ticketing websites can also offer insurance for events that don’t happen, or tickets that don’t arrive. If you want to sell tickets rather than buy them, contact the ticket sales websites or agents direct, and ask for advice. They will usually charge you a percentage of the ticket sales but each site is different. Do a little research. It’s possible to sell tickets for an event yourself through public access sales sites, such as eBay or Gumtree, but it’s generally a lot more hassle as you will be dealing with your buyers direct, and you’re not so well covered in terms of insurance. How Can I Tell If A Ticket Is Genuine? The Office of Fair Trading found in 2010 that one in 12 festival-goers had been duped into buying forged tickets. There are a lot of really good fakes out there, and it’s hard to know how to tell the difference. The best thing you can do is ensure you buy tickets online from reputable platforms. For a full list of authorised ticket sales outlets, both online and otherwise, visit the website of the Society of Ticket Agents and Retailers. My Tickets Haven’t Arrived In The Post, What Should I Do? Providing you buy your tickets from a reputable site or agent, there is usually a guarantee that your ticket will arrive on time, and if it hasn’t you should receive a refund. Check this when you are buying your ticket and, if your ticket hasn’t arrived in good time, contact the seller to let them know. Don’t leave it until the last minute, so that if a replacement can be sent out, you’ll still have time to get to your event. I'm Hosting An Event. What Kind Of Security Will I Need? It will depend on the event, but security can range from having a single person on the door or entrance to ensure there are no unauthorised entries, to having a team of staff and marshals throughout the venue, full perimeter fencing, and CCTV cameras. At some venues there may even be equipment for scanning bags and cars on entry. How Do I Know Exactly What I'll Need To Host An Event? If you’re not sure yourself, contact two or three different agencies and ask them to offer a proposal. Agencies should also offer a risk assessment for your event, pointing out where there could be security issues and advising accordingly. As with all components of planning an event, it’s best to get at least two comparative quotes. So work out how your event is going to run and invite the security companies to talk it through with you. They’ll have a good idea of what you need based on your plans and anticipated attendance. Try to give them as much information as possible. It’s also a great idea, if you can, to attend the site with the companies so that they can assess the venue accurately. Otherwise ask the venue to send floor plans. 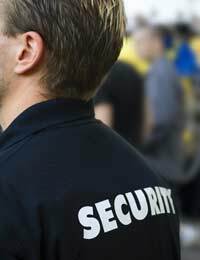 How Do You Book Trustworthy, Professional Security? Look for staff that are SIA licensed and CRB checked. SIA is the Security Industry Authority and is the independent governing body, reporting to the Home Secretary, responsible for regulating the private security industry. The SIA has two main functions: to ensure the compulsory licensing of individual security staff; and to manage the Approved Contractor scheme, which measures security suppliers – the agencies offering security staff – against independent assessment criteria. Security staff should also be CRB (Criminal Records Bureau) checked to ensure they have a clean record. Should Security Staff Hold Insurance? Yes. You should ensure that all your security personnel have Public Liability and/or Employers' Liability Insurance. Ask to see certificates if you require confirmation.